This butterscotch syrup is smooth, buttery and deliciously sweet. Tasting just like the hugely popular butterscotch candy, it is such an easy way to re-create your favourite flavour. This syrup has flavours of brown sugar, butter and subtle vanilla. It adds a delightful, smooth flavour without being over powering or too sweet. DaVinci is dedicated to only using the highest quality ingredients, which is what gives this product such an exquisite flavour. Free from artificial colours or flavours, there is no nasty aftertaste or hint of chemicals which can sometimes be detected in sweeteners. Where Can I Buy Butterscotch Syrup? 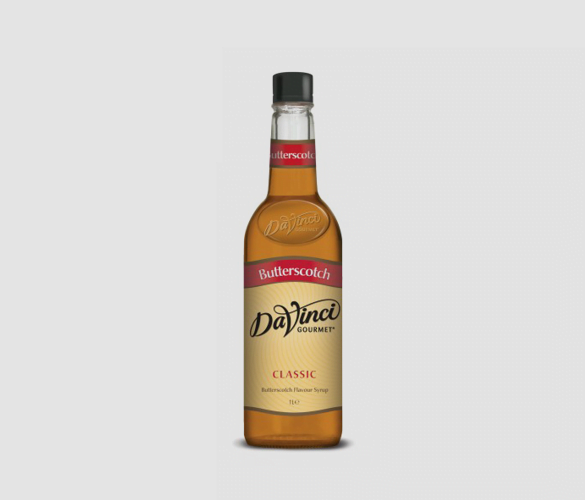 Purchase this butterscotch syrup and know that this is a product you can rely on. From the delicious flavour that performs every time, to the plastic user-friendly bottle which is much safer than glass products. The plastic bottle is re-assuring when stored in a kitchen with children or a coffee shop that gets busy. Pancakes – Drizzle over pancakes or waffles for an extra special breakfast. Milkshakes – This is such a simple way to liven up a dull milkshake and add a touch of sweetness. Coffee – As this flavour is not overly sweet, it goes great in coffee. Lattes, cappuccinos, americanos or whatever coffee you prefer. Tea – If you are more of a tea drinker, this syrup works just as well. Add a little at first to see how much flavour you would like. If you are a Harry Potter fan, you may be curious to try the famous butterbeer recipe. The semi-sweet beverage is unique and is a popular option in the Wizard World. In a large bowl mix together the cream soda and syrup. Beat the cream until soft peaks form, you may need an electric whisk for this. Fold in the sugar and vanilla extract into the cream, and then the melted butter. Pour the butterbeer into glasses and top this whisked cream.